Makes: around 4 Servings of Chayote Masala. Wash and cut the chayote into half. Discard the ends, seeds and chop chayote into small cubes. Wash and roughly chop the tomatoes. Grind the tomatoes into smooth paste using a blender. Heat a tsp of oil in a pan, add sliced onions and fry till they turn golden brown in color. Grind the onions into smooth paste. Add little water while grinding the onion if necessary. Fry briefly, stir in ground onion paste. Stir in coriander powder, garam masala powder, turmeric powder, red chili powder and salt. Fry for around half a minute, stir in tomato puree and chopped chayote. Boil the mixture till chayote is cooked (around 10 minutes). Adjust any seasonings if necessary and remove from heat. Notes: Make sure to cook the chayote well. 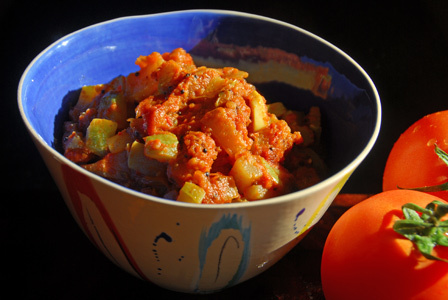 Suggestions: If the chayote is not cooked completely, let it boil in the tomato mixture till cooked. Add water if necessary during the cooking process. Variations: Check other chayote recipes here. Other Names: Chayote Masala, Benguluru Vankaya Masala. Chayote is ground into paste along with coconut and spices. It is then mixed with rice flour and into dosa batter. 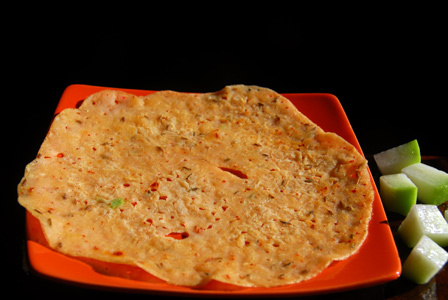 The dosa batter is then poured onto hot pan and roasted till dosa is cooked and crisp. Serve chayote dosa with sambar or with any chutney of your choice. Makes: around 4 Chayote Dosa. Wash and roughly chop the chayote. Break the red chiles into pieces. Grind chopped chayote, coconut, broken red chiles and salt into smooth paste adding enough water. In a mixing bowl, add rice flour, ground chayote mixture and salt. Stir in enough water to make the batter little on a thicker side. When pan gets hot, pour a ladle full of chayote dosa batter on pan in circular motions. Try to fill up any big holes and form into around 7 inch diameter dosa. Repeat the same with remaining chayote dosa batter. Serve chayote dosa with sambar or with any chutney of your choice. Suggestions: If the dosa doesn’t come out of the pan, make sure dosa batter is not too thin. If dosa comes thick, make sure batter is not too thick, and adjust the batter consistency accordingly with water. Variations: You can also add curry leaves or cilantro leaves in the batter if you wish. Other Names: Chayote Dosa, Benguluru Vankaya Dosalu. Chayote is chopped and cooked in oil along with onion and tomato. The mixture is then added to the whisked yogurt for chayote raita. Serve quick chayote raita with steamed rice or with roti. Makes: around 4 Servings of Quick Chayote Raita. Wash, halve, remove seed and finely chop the chayote. Remove stem, halve, remove seeds and finely chop green chile. Heat oil in a pan, add chayote. Cook for few minutes, stir in onion and green chile. Fry till onion is translucent, add tomato and salt. Fry briefly and remove from heat and cool the mixture to room temperature. In a mixing bowl, whisk yogurt, cilantro and salt well. Stir in the above chayote mixture and adjust salt if necessary. 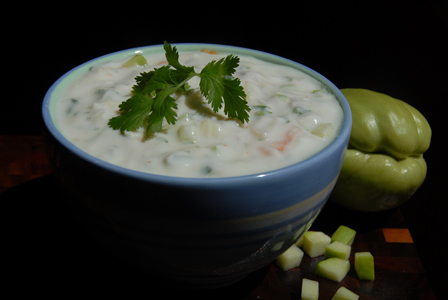 Serve quick chayote raita with steamed rice or with roti. Notes: Make sure chayote is clean without any blemishes. Suggestions: Adjust consistency of raita with water. Variations: You can also add a pinch of cumin powder if you wish. Other Names: Quick Chayote Raita. 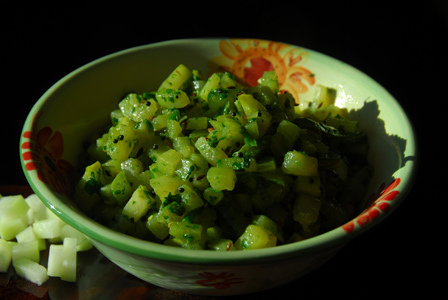 Chayote is chopped into small pieces and cooked in oil along with whole spices. Cilantro is chopped up and freshly ground into paste along with ginger and green chiles. Chayote is finally cooked in the cilantro mixture. Serve chayote cilantro curry with steamed rice and dollop of ghee. Makes: around 4 Servings of Chayote Cilantro Curry . Lightly peel and wash the chayote. Halve, discard the seed and chop the chayote into small pieces. Wash cilantro with fresh water and roughly chop the cilantro leaves. Grind green chiles, ginger and cilantro into smooth paste adding little bit of water. When mustard seeds start spluttering, add chopped chayote. Cook covered on low flame for a minute or two to let the chayote cook. Uncover, stir in ground cilantro mixture. Fry for a minute or two, stir in turmeric powder and salt and remove from heat. Serve chayote cilantro curry with steamed rice and dollop of ghee. Notes: Make sure chayote is cooked well before removing from the pan. Suggestions: Adjust spice with green chiles. If chayote is not cooked well, put the curry back on heat and cook covered on low flame till done. Variations: Check other recipes with chayote here. Other Names: Chayote Cilantro Curry, Benguluru Vankaya Kothimera Kura. Chayote is chopped into small pieces and cooked in oil along with whole spices. Moong dal is boiled separately till soft but whole and added to the cooked chayote. 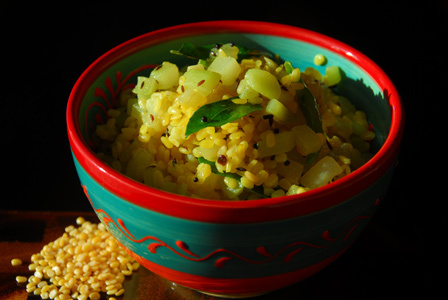 Serve chayote with moong dal with steamed rice and dollop of ghee. Makes: around 4 Servings of Chayote with Moong Dal. Wash moong dal in water and boil in a cup of water for around 15 minutes. Once moong dal is cooked and turns soft, strain it. Uncover, stir in moong dal once chayote is cooked and soft. Serve chayote with moong dal with steamed rice and dollop of ghee. Notes: Make sure moong dal is boiled well before adding to the pan. Other Names: Chayote with Moong Dal, Benguluru Vankaya Pesarapappu Kura.